Some orcas stand out for their appearances. In 1970, hunters that captured orcas for aquaria encountered a group of five eccentric individuals. Three of these animals lost their freedom for good, but two others returned back to the wild. 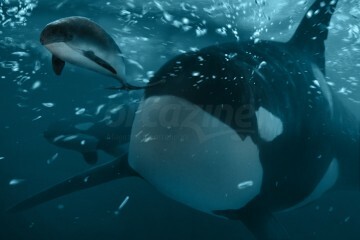 The further story of these two animals illustrate the typical, more flexible, social bond between Bigg’s orcas. People can still enjoy the offspring of this special group. 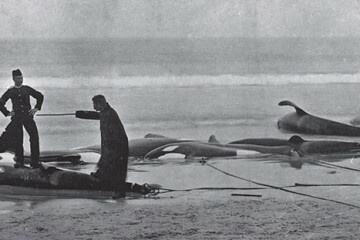 On March 1, 1970 a group of orcas was captured in Pedder Bay near Victoria on Vancouver Island. The animals were intended for aquaria. The group consisted of five individuals: Charlie Chin (T1, ♂), Pointednose Cow (T2, ♀), Scarredjaw Cow (T3, ♀), Chimo (T4, ♀), and Nootka (T5, ♀). Charlie Chin was probably the son of Pointednose Cow, and Chimo was likely the daughter of Scarredjaw Cow. It turned out later that the orcas belonged to the mammal-eating Bigg’s population, a unknown phenomenon in 1970. 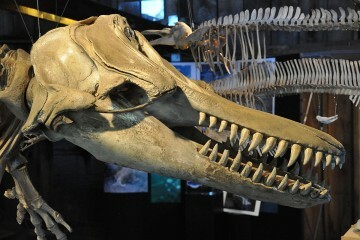 A remarkable feature of this group of orcas was the abnormal shape of the head and jaws of the animals. This was most clearly visible in Charlie Chin. He had a protruding lower jaw. 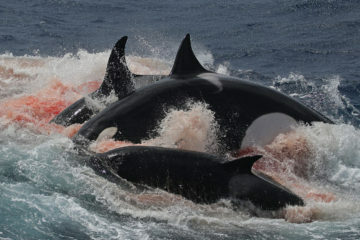 But most striking was the white color of the young orca Chimo. The color was caused by the genetic Chediak-Higashi syndrome. This made Chimo more susceptible to infections, and gave her a lower life expectancy. A white orca is rare. However, there have been sightings of a white orca off the west coast of Canada since 1923. Pointednose Cow and Scarredjaw Cow have been photographed together with a white orca in 1958. This could not have been Chimo, since she was not fully grown yet during her capture in 1970, and it was estimated that Chimo was born in 1965. 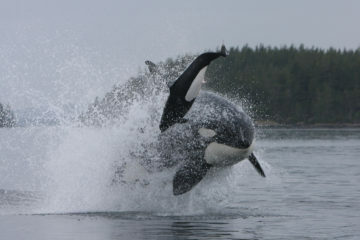 This other white orca was known as Alice (T6). 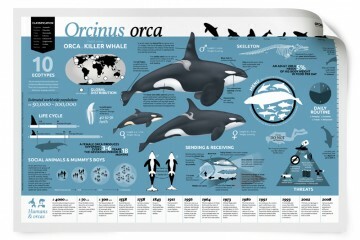 Whether the white orca from 1958 was the same individual as was seen since 1923 is unclear. It is possible that these were two individuals within the same group, because the syndrome causing the abnormal color is hereditary. The video above was created by divers of Jacques Cousteau in Sealand of the Pacific. The divers are trying to feed them fish. 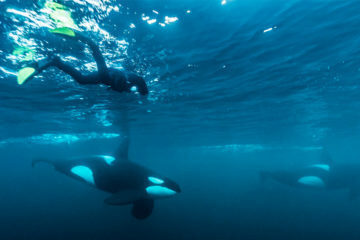 Unaware of the fact that two of these orcas are used to eat meat only. Chimo is also underwater a striking appearance. Less than a month after the capture, Chimo and Nootka were moved to Sealand of the Pacific, an aquarium in Victoria. The aquarium already had an orca, the Southern Resident male named Haida, who was captured in October 1968. Chimo and Nootka did not want to eat in Pedder Bay, but started to eat fish in the aquarium with help of Haida. The three orcas seemed to get along well in the beginning, but problems between Chimo and Nootka started soon. Nootka was behaving aggressively towards Chimo, and it became clear that one of them had to leave. Nootka was sold to Japanese Deer Park in California, and Chimo remained at Sealand of the Pacific. Chimo did not survive long. She died in November 1972 of an infection, two and a half years after her capture. Nootka survived longer in captivity. 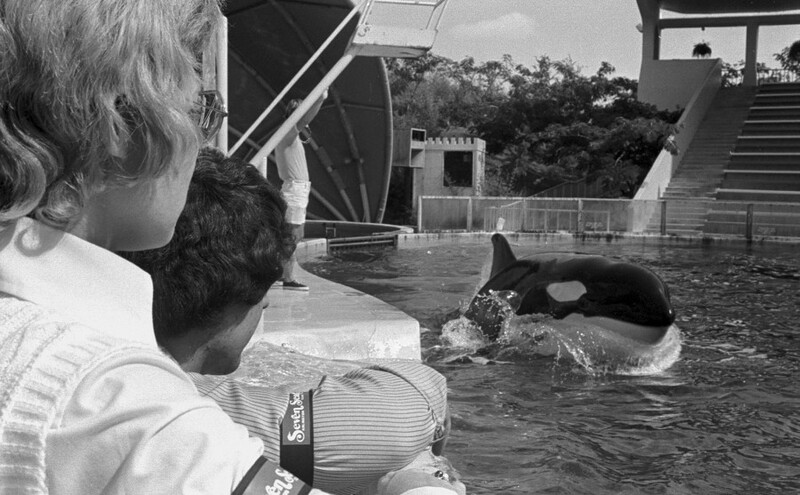 She was moved several times during her life in captivity, and was also held at Seven Seas in Texas, Marineland in Ontario, and eventually ended up in SeaWorld in California. 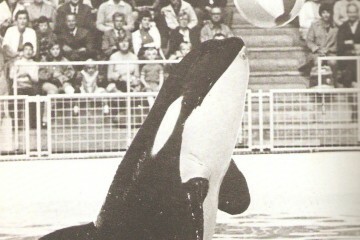 She passed away in March 1990, after twenty years in captivity. Scarredjaw Cow and Pointednose Cow were sold to Seven Seas in Texas. Charlie Chin would be released. Despite being sold, the three orcas remained in a netted area in Pedder Bay. During a long time, they refused to eat the fish that was offered to them. 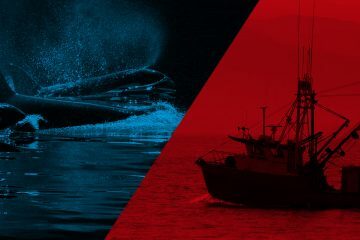 Which was not surprising, since they were used to hunt on marine mammals. 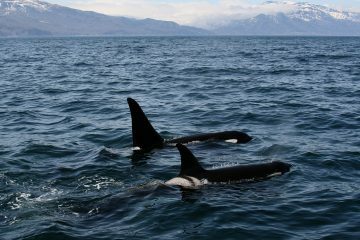 After two months, the orcas became so emaciated that the contours of their rib cages became visible. Scarredjaw Cow died 75 days after the capture. After sunset, her body was brought to sea and dumped in the ocean. Her body sunk immediately and was never found again. A few day after her death, a veterinarian gave Pointednose Cow and Charlie Chin an injection with liquid glucose and vitamin B12 to stimulate their appetite. They received another injection the next day. In addition to the problem with eating, Pointednose Cow also had a sunburned back because she would float at the surface. Therefore, zinc ointment was used to cover her skin. 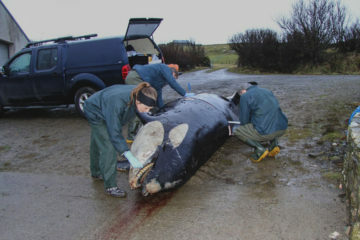 The evening after the second injection, both orcas were offered fresh salmon. Charlie Chin took the first salmon and swam to Pointednose Cow with it. They each ate half. Since that moment, the orcas ate large amounts of fish each day, and their health improved considerably. Because Scarredjaw Cow had died, Charlie Chin would go to Seven Seas with Pointednose Cow instead of being released. However, the transport never happened, because the two orcas had a chance to escape on October 27, 1970. Someone had loosened the net and threw weight over the net to sink it. 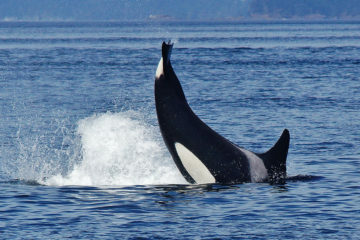 After almost eight months, the orcas had their freedom back. 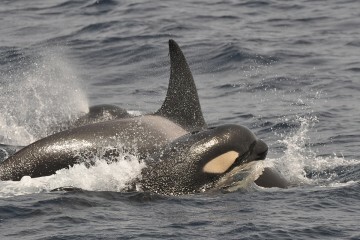 After their release back to the wild, Pointednose Cow and Charlie Chin returned to the typical diet of Bigg’s orcas: marine mammals. In the following years, Pointednose Cow gave birth to several calves: Bajo (T2A, ♂) in 1972, Pedder (T2B, ♀) in 1979, and Tasu (T2C, ♀) in 1989. In 1978, Bajo disappeared from the group. Several years later, in the autumn of 1986, he was seen near the north of Vancouver Island. He was alone and was hunting on sea bird. It was a mystery where he had been all those years. Bajo’s last encounter was in 1988, near Glacier Bay in southeast Alaska. Also Charlie Chin did not stay with the group. The first time that he was observed without the group was in 1986. Sometimes he returned to the group, but often he was seen alone. Charlie Chin eventually disappeared in 1992 after a sighting at Dixon Entrance in Alaska. 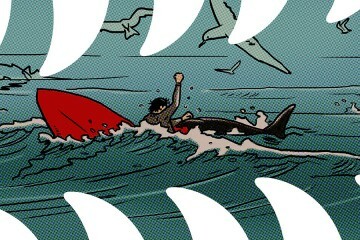 This was the last official sighting, his distinctive dorsal fin has not been seen again. Pedder also started to spend time without her group since 1992. She gave birth to a calf in 2006, but the calf died in 2007. 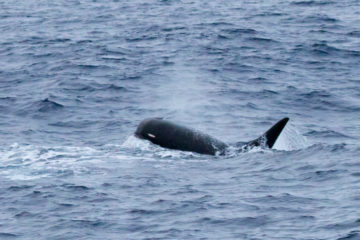 Pedder was still observed in 2015 and is often seen with the T60’s. Daughter Tasu remained with her mother Pointednose Cow. Pointednose Cow, later known as Florencia, is missing since 2009 and is presumed dead. Tasu is still alive and has a number of offspring: Rocky (T2C1, ♂) born in 2002, Tumbo (T2C2, ♂) born in 2005, and Lucy (T2C3, ♀) born in 2011. Tumbo can be recognized by the unusual shape of his spine. 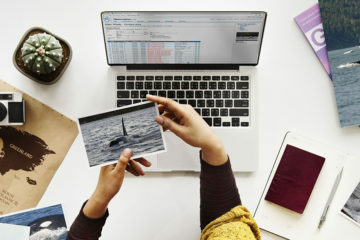 Tasu and her children have been seen together in the waters around Vancouver Island in 2016, in the same waters where once their eccentric but famous relatives were captured.